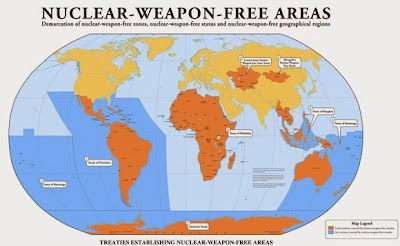 Many years ago I learned in school that most states holding nuclear weapons have agreed in theory to cut back; in exchange, the many states without nuclear weapons promised not to build them. The Treaty on the Non-Proliferation of Nuclear Weapons (NPT) entered into force in 1970. But the nuclear states have failed to reduce their arsenals, and instead use their nuclear status to aggressively dictate their vision of a New World Order. Certain states claim "Permanent" world-ruler status at the United Nations Security Council, though unelected. Many smaller states and leaders recognize they've been hoodwinked and marginalized. The situation is unsustainable. The 2015 NPT Review Conference collapsed without progress, and Israel, India, Pakistan have still not signed the NPT (North Korea signed but later withdrew). Nuclear weapons must be eliminated; the big bad nuclear states must do more for disarmament -- as promised. Let's expand the Nuclear-Weapon-Free Zones. Why can't Japan pledge to be nuclear-weapon-free? Where is the often progressive Swedish government? R U Dinji / Dingy?